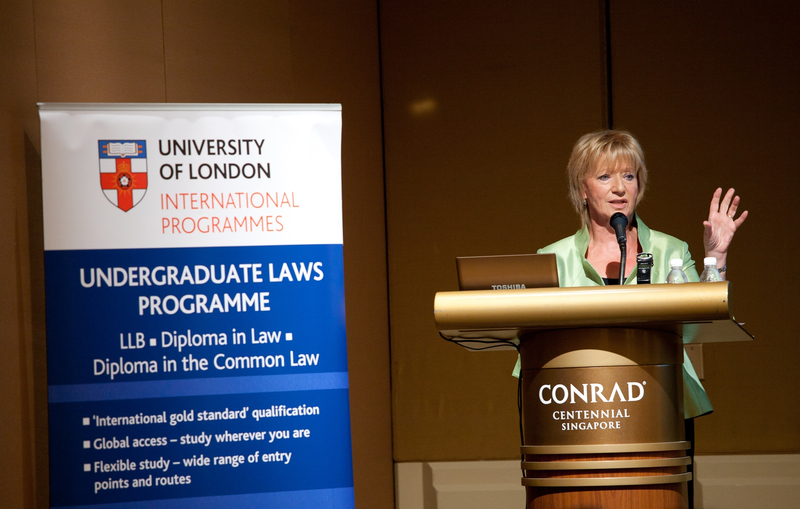 Professor Jenny Hamilton, Director, Undergraduate Laws Programme and Simon Askey, Deputy Director and Head of Programme, Undergraduate Laws Programme, travelled to Malaysia and Singapore last week to host two high profile lectures organised by the Undergraduate Laws Programme. The Former Chief Justice of Malaysia and members of the local legal community attended a public lecture held at the Shangri-La Hotel, Kuala Lumpur, on Monday 9 July. Delivered by Professor Dame Hazel Genn, Dean of Laws and Co-Director of the UCL Judicial Institute in the Faculty of Laws at University College London (UCL), the lecture reviewed the use of private mediation as an alternative to judicial determination. Focusing principally on civil and commercial disputes, Professor Genn, a leading figure in judicial and government policy in the United Kingdom, traced policy development since the mid-1990s and reviewed the benefits and downsides of mediation for parties and lawyers. She also reflected on current pressure for compulsory mediation as a cost-saving measure and questioned the extent to which mediation should be viewed as a vehicle for access to justice. Chaired by the Honourable Tan Sri Datuk Seri (Dr) James Foong, an alumnus of the University of London International Programmes, the lecture attracted guests including the Former Chief Justice of Malaysia, The Honourable Tun Zaki Tun Azmi; Federal Court Judge, Yang Arif Tan Sri Abdull Hamid Bin Embong; and Acting British High Commissioner Ray Kyles, as well as alumni and current students of the University of London. The lecture was organised by the Undergraduate Laws Programme and the Alumni Office, with support from the ASEAN Law association of Malaysia. During their visit to Malaysia, Professor Hamilton and Professor Genn attended the Judges Annual Conference in Kota Bharu, where Professor Genn addressed the conference on the UK Judicial Appointments system. Senior members from the Malaysian judiciary system, including the Malaysian Attorney General, The Honourable Tan Sri Abdul Gani Patail, were in attendance at the conference, chaired by The Chief Justice of Malaysia, The Right Honourable Tun Arifin Zakaria. The next stop for Jenny, Simon and Professor Genn was Singapore, where a second public lecture on private mediation was hosted by the Undergraduate Laws Programme on Wednesday 11 July, at the Conrad Centennial Singapore. Professor Hamilton chaired the lecture, again delivered by Professor Genn, at which distinguished guests included the Chief Justice, The Honourable Chan Sek Keong; Judge of Appeal Justice Chao Hick Tin; and the Chairman of the Singapore Mediation Centre, Justice Belinda Ang. Also in attendance were University of London alumni, current students, staff from supporting institutions and members of the Singapore legal community. The lecture was supported by the Singapore Mediation Centre (SMC). Established in 1997, SMC is dedicated to the resolution of disputes through the use of mediation and receives the support of the Supreme Court and the Subordinate Courts of Singapore. The lecture was filmed and footage will be available on the University of London International Programmes YouTube channel in the next few weeks. The lecture held at Conrad Centennial in Singapore was a major success. It was probably the first time that the University of London International programme students, met and rubbed shoulders with the local fraternity at a lecture organised by the University of London International programmes. The lecture by Prof Genn itself went very well with my students as they could relate it, to their studies and it was knowledge gained. It was an enriching and fruitful experience according to many of my students and they would dearly welcome more of these talks. I really want to thank you for sharing the post.This is a Great post.I think you have a high knowledge , and so much passion. You also know how to make people gathering behind it.I got this post uncertainly as I was searching for Law College in London. Keep posting further.